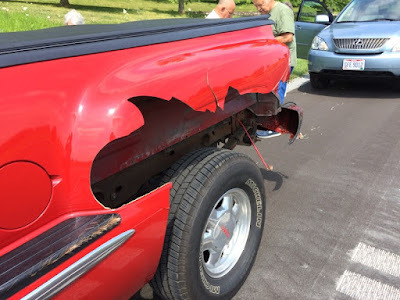 Friday it was Pretty Red GMC vs Deer. 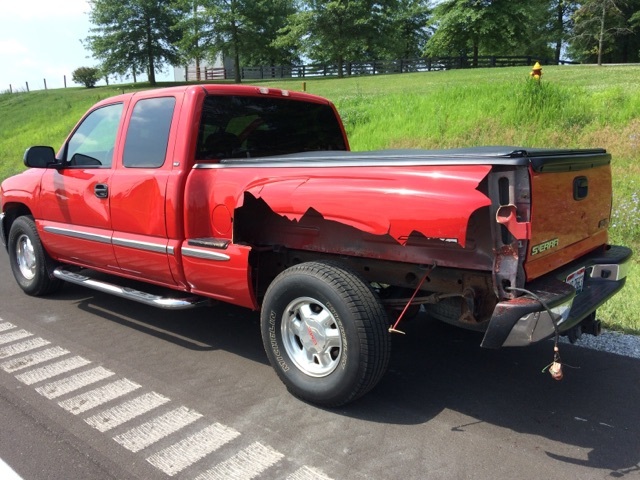 The GMC was badly battered but definitely prevailed. I mentioned Monday that the trip to Kentucky last Friday contained a bit of excitement. That might be and understatement. It might be more accurate if I add that it was a day of adrenalin, heart pounding, fear and miraculous preservation! Mom and Dad were on their way to Kentucky with my Uncle Jerry and Aunt Garnetta behind them. Cousin Debbie and her husband Sonny were right behind them. Suddenly a deer jumped over the guardrail into an oncoming car. A woman was driving that car with several children with her and she could not avoid the leaping deer. 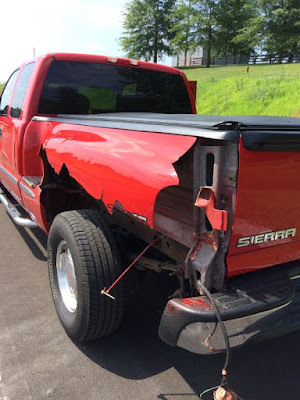 She hit the deer with the front of her car just as it was landing and the deer was thrown violently into Dad's shiny red truck. You can not see the extent of the dent in the front door but it hit right at the handle very hard and the momentum carried down the side of the truck. 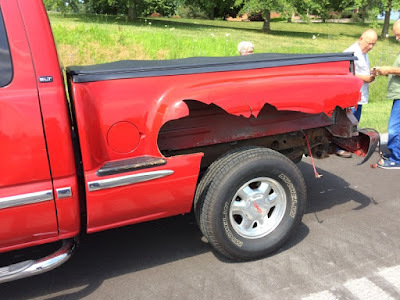 Every one involved said it looked like the deer exploded on impact and deer parts and red truck parts went flying through the air. Can you believe the extent of the damage? There are things that cause us to be thankful. All the cars involved and following were able to get stopped and pulled off the busy highway without further problems. The original car that could not avoid the deer was heavily damaged but still drive-able . No one in that car was injured. Mom and Dad were not injured and they were also able to drive away. Our family traveling in the two cars behind them were not hit with debris at all as far as they could tell. That is amazing. 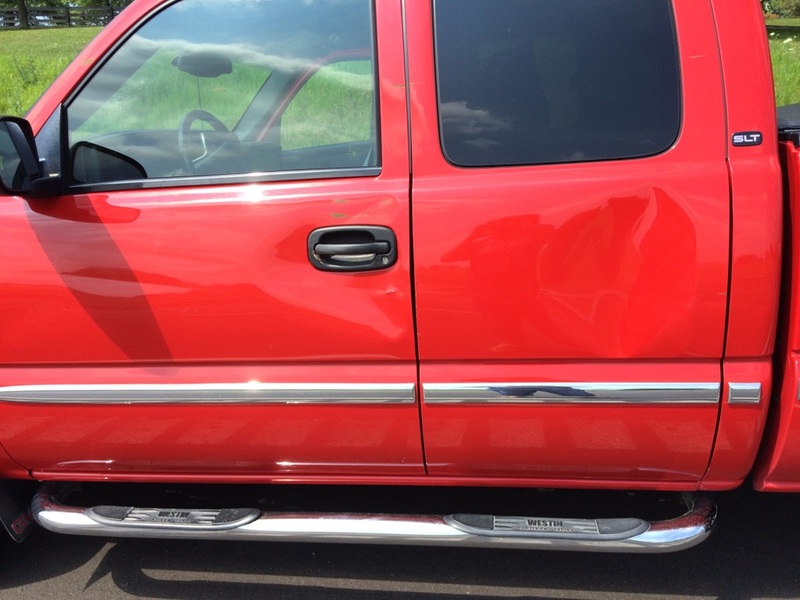 Also if Mom and Dad had been driving their car, the initial deer impact would have been at the driver's side window. That could have been catastrophic. It was a traumatic day and it will take a while to get the truck fixed but we thank God they are alive and well. Thank you for dropping in to visit today. Yes He is! Thank God for His wonderful help!